Rolled Chicken Tacos are set to return to Taco Bell for the fourth time starting this Wednesday, November 21, 2018. Available for a limited time nationwide through late December, Rolled Chicken Tacos (or as I like to call them: "taquitos") feature seasoned, shredded white meat chicken rolled up in corn tortilla and then deep fried. 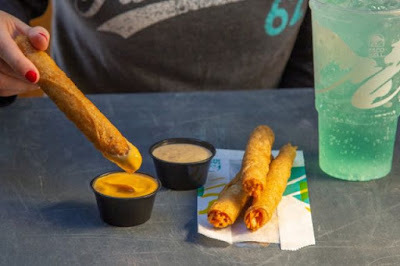 They come with your choice of either a cup of Spicy Ranch, warm nacho cheese sauce, or guacamole for dipping. The suggested price for two plus one dip is $1.99 (may vary). They're also available in a pack of four (with two dips) for $3.99 and a $4.99 combo that includes four Rolled Chicken Tacos, two dips, and a large drink.